HHL offers more than 130 partner universities to choose from when going abroad – Marc Lorenz decided to attend EDHEC Business School in Nice, in the heart of the French Riviera. Alix Robert in return came to Leipzig. A review about their exchange experiences. “It is easy to perceive Nice as just this tourist hotspot full of rich people and yachts, which it certainly is during the main season. But when the summer comes to an end, at least time-wise, and most tourists have left the city, you start to explore the everyday-life of Nice, although you will probably never lose the surreal feeling of being on vacation”, says the HHL M.Sc. student Marc Lorenz. 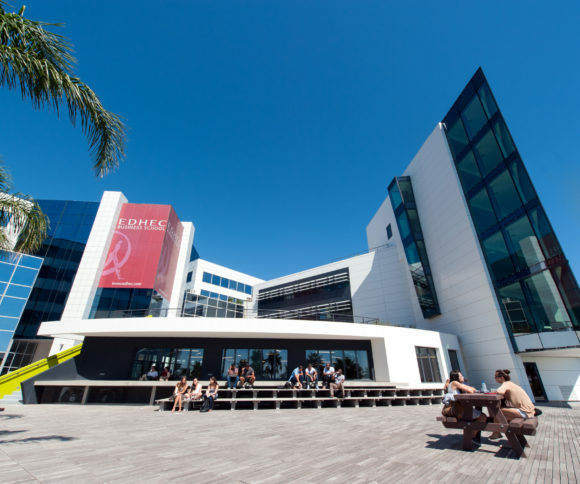 Having the choice to do so, Marc decided to spend an Erasmus semester at EDHEC campus in Nice instead of Lille, which is another campus of EDHEC. EDHEC (École de Hautes Études de Commerciales du Nord) is one of the few Grandes Écoles in France and is ranked one of the top 15 European Business Schools, holding a Triple Crown Accreditation from EQUIS, AACSB and AMBA. Among the additional operating campuses in Paris, London and Singapore, the campus in Nice stands out: It is situated on the picturesque Promenade des Anglais with an overlook of the Mediterranean Sea, offering 300 days of sunshine per year and approximately 100 km of beaches. The modern complex provides an excellent environment for learning, teaching and research. Several areas are dedicated to sports, arts and voluntary activities –for instance, the fitness centre is offering a wide variation of courses such as pilates, zumba and body bar. Nice, nicknamed “Nice the Beautiful”, has a population of almost 350.000 people and is, as a vacation resort, famous for its international atmosphere and cultural offers, including numerous museums and hosting events such as the Nice Carneval or the Nice Jazz Festival. “In the evening, the streets are full of life, even during the week. It all contributes to a pleasant atmosphere as you might expect it from the Côte d’Azur. Furthermore, there are plenty of places around Nice worth visiting – be it the breath-taking mountains with picturesque French villages, for example Gourdon and Eze, or famous metropoles such as Cannes and Monaco”, says Marc. Despite these differences, HHL and EDHEC share a similar welcoming spirit when it comes to international students. “The international relations office made it very easy for exchange students to start at EDHEC and to handle the different procedures. Regular information sessions combined with sufficient opening hours and prompt mail service helped us handle different issues. EDHEC welcomes a large number of exchange students with whom it is very easy to connect.”, says Marc.